(Soccer) Football Games you can play all day long with you pals, if you've got pals of course, those aren't tears are they? These games are not only great for a laugh but they can help you improve areas of your game such as ball control, passing, shooting and most importantly enjoying yourself on the pitch. Some football games are more difficult then others and can be difficult to get use to in the beginning but behind all of these games is a chance to improve and have some fun. Just make sure you aren't the one in the middle the whole time. Head, Chest, Foot | Head, Catch | Stall and Pass If you've got the skills, these are the (soccer) football games to match them. It's as easy as the title indicates but just so there's no confusion. -5,6 or 7 players make a circle or square about 10 yards by 10 yards and 2 players are in the middle. -The players on the outside have generally 1 touch but 2 touch if you're just beginners to keep the ball from the two in the middle. -If one of the two in the middle touch the ball, they switch out with the one they stole it from. -If the players on the outside pass it successfully 21 times, the two in the middle have to stay in an extra one, oh and they also get a sarcastic round of applause from their teammates in the cirlce. This truly is the best and most fun you can have playing the game. Again fairly self explanitory but there are several rules and variations. -A 10x10 area will do, outlining the court with cones or lines just like a mini tennis court. -Best played 2v2 but also 1v1. You get one bounce before you have to play the ball back over the net(which is about 3 feet off the ground). -Points are awarded when you hit a winner over the net and the other team doesn't return it back in. -Games are played to 21. -You can get points on either serve. Great way to get out and work on your ball service, all you need is a ball to get going. -You can play with as many players as you have balls. -The beauty of this game is you can play literally anywhere, go to a park, a field or in the streets. -Start at any spot, select any object to be the hole and see who can get there in less kicks. Lowest score wins. Got it? Good. This like the other (soccer) football games tests accuracy, skill and nerves. -You can either take turns or one person can go until they get all three and switch. -You need to hit all three posts and lowest amount of shots do it wins! -If you hit the part where the post connects with the crossbar, that's two slick! Now that 3 post has got your nice and warm, its time for the crossbar challenge, another one of many great (soccer) football games. -Line up ten balls outside the 18 yard box. -Hit each ball and see how many times you can hit the crossbar. -Now switch, most balls that hit the crossbar wins! Didn't get any? Don't worry nobody saw. Great game to test your juggling skills with a twist that'll keep you on your toes. -Can be played with 2 or more. -The game starts with one person juggling the ball, as soon as they keep it up a few times as they pass it they call out a number between 1 and 5. -The person receiving the pass (all in the air of course) must juggle that number then as he does that he passes it along and calls out a number for the next person to juggle. -Essentially you keep the ball up as many times as the person who passed it to you says then you do the same to the next person. -You drop the ball, or do too little or too many juggles other then the specified number you're OUT! -It's important to remember to give the person you are passing the ball plenty of warning before passing or it won't work. (soccer) football games such as this one take a bit a skill and thinking so don't wander off now. Another great game where shielding and maintaing possession is key. -The game is played in a grid depending on how many players there are, not too much room but not too little to start. 10x10 will do. -Everybody has a ball, and the the object of the game is to keep control of your ball within the area while knocking out the opponents. -If you lose control or your ball gets kicked out of the area you are out. -Last person with the ball in the grid wins! Simple and fun football games at their finest. All football games are not made equal, you gotta be quick if you're gonna stand a chance with this one. -Make a grid about 7 yards wide and about 20 yards long. Or just use the 18 yard box to start. -One player will start off as the sniper their job is to hit the other players that run across the grid below the waist with the ball. -The sniper stands outside of the grid and the players run across from one side to the other trying to avoid being hit. -If you get hit you join the sniper until there is one person left and they are declared the winner. -The following person then does those two tricks and adds on to it and so on and so forth. -You have 3 lives, every time you don't complete the move with your add on then you lose a life, lose all 3 lives and you're out. -After somebody is eliminated the moves start from the beginning again. -Game can be played with 2 or more, best with 3 or more. -The ball is kept up in the air and alternates touches of the head, chest and foot. For Example: If three people are playing, first person throws the ball up to one of the players, they hit it with their head to somebody, that person chests it to somebody and the next person uses their foot to keep it up and pass it along. -The chain of head, chest and foot continues until somebody breaks the rhythm then they're out. -Game is played until their are two left then obviously the one remaining is the winner. Like many of the (soccer) football games this one requires you to use your head for something besides growing hair. This type of game is much easier said then done. You're going to read over the rules and think this game is child's play, but even the most seasoned pro's mess this one up. -One person stands with the ball and the rest of the players face him or make a circle around him if their are several. -The person with the ball leading the game throws it at somebody and says the word "head" or "catch", the idea is the person receiving the ball has to do the opposite of what the person says. So if they say head you have to catch it and if they say catch you have to head it. -The person leading the game doesn't' give out any warning or doesn't call out any names just says head or catch as they throw it at somebody. Last person standing wins! Skill is the name of this game. 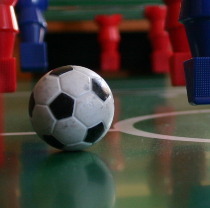 -One player stalls the ball on top of their foot, then they pass it to the next person without it hitting the ground. -The second player has to cradle this ball and continue stalling it on to their foot, this process is repeated back and forth until there is one winner. Football games such as this one can be tricky especially when you see that ball coming toward your non-dominant foot. Try and expand your limitations and push yourself to try things you need to develop.